An all-new inspirational daily reading Bible designed specifically for girls 13-18, in the popular NIV translation. The NIV Bible for Teen Girls, designed specifically for girls ages 13 to 18, is for real teenage girls with real lives. Packed with daily readings, highlighted promises of God, challenging insights, smart advice, and open discussion about the realities of life, this Bible is designed to help teen girls grow in faith, hope, and love. The NIV Bible for Teen Girls is as sincere about your walk with God as you are, helping you discover his will for all areas of your life, including relating to your family, dealing with friends, work, sports, guys, and so much more. 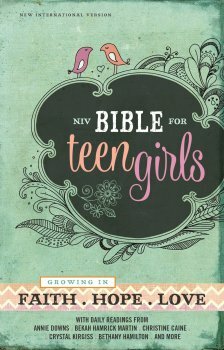 NIV Bible for Teen Girls: Growing in Faith, Hope, and Love is the perfect Bible for teen girls! This Bible is beautiful and something teen girls will love to show off. I love the daily readings because they are by popular Christian female authors. The challenging insights, smart advice, and open discussion about the realities of life is something ever teenage girl will find useful in their daily walk with God. Another thing I absolutely love about NIV Bible for Teen Girls: Growing in Faith, Hope, and Love is that it has verses worth remembering highlighted, a concordance and highlighted promises of God. This is an absolutely fabulous Bible for teen girls! You can find NIV Bible for Teen Girls: Growing in Faith, Hope, and Love on Amazon and at other bookstores.